The entire team must cross the acid swamp using the planks provided without any of the planks or anyone touching the acid. 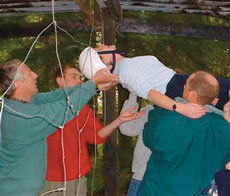 The team, whilst blindfolded, must tie a reef knot in the centre of the rope provided. The team is blind. To restore their sight they must form a perfect square using the whole length of rope provided. 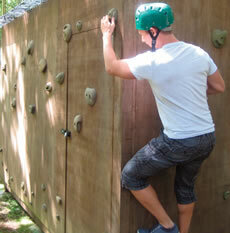 The team must attempt to gain control of rooms for trading and gaining full sets of keys. A loud, fast and furious ice breaker. A large multi team activity. Up to three teams frantically trade on th market in order to earn bonus payments for team members. Time is a massive constraint, pressure surrounds everyone. Negotiation skills are a must. The facility represents a suspension bridge that has partly collapsed, leaving only the main uprights standing. 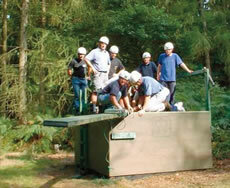 The team's objective is to get everyone safely from one side to the other without touching the ground. The team is divided and have 20 minutes to build the components for a bike. Then they must get together and assemble the parts. The aim is for the team to reconstruct, exactly as the original, a 'modern sculpture' that has been knocked down to the bottom layer. 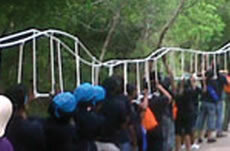 As a fun task, the team forms the wheels in the centre of a caterpillar track. The team needs to co-ordinate their efforts to complete the course and win the race. A satellite has crashed scattering data crystals across the face of the cliff - your team must retrieve them. A simulation exercise, where the team is a unit that has to manage an area after a major disaster. From their underground bunker, the only link with the outside world is via telephones to the police and army - crisis management at it's best. The team must work together to crack the code to release the treasure. However they must ensure that everyone understands the code as not everyone will make it into the chamber! You must transfer the cursed doubloons to Davy Jones's Locker. With their boat capsizing, the team has reached the relative safety of a dingy but now need to decide which items of equipment they can take with them. The team is tasked with designing and building a pipeline capable of transporting water across the dessert to a drought stricken area. They are also in competition with another contractor who has already submitted their tender. Win the egg race by projecting the egg the furthest distance, without causing any damage to the egg itself - they are fresh, not hard-boiled! The team has an opportunity to enter a competitor's research & development laboratory. 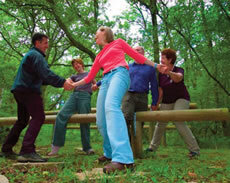 To succeed they must use the equipment provided to cross an electrified and alarmed fence without anyone or anything touching the fence, fence posts or ground in between. As a team of journalists, the team must decide which story should appear on the front page. Each team member has a story of their own, which they feel is the most important issue of the day. Which one will appear on the front page? The team members are surgeons correcting a problem at the gene pool, caused by the laboratory cleaners. The cleaners have mixed up the genes. If the problem is not corrected within half an hour the genes will become useless. A team of jewel thieves have completed a diamond heist and need to split the booty before making their getaway. No one trusts each other - they must all share the job of splitting the goods and it is tougher than they bargained for! Can you get the rings on the giant's finger? The team must tie the giant's shoes - in the dark. In this variation of the TV series, the teams are given all sorts of goodies, and their challenge is to build a 'machine' capable of projecting an egg the greatest possible distance. 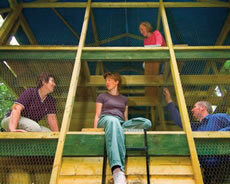 The team must work out a route through the maze. Unfortunately, although they know where the maze is, they cannot see the structure of it, due to new high tech security features. No one may talk in the maze for fear of discovery. Another good icebreaker. The team has to cross a lake using some 'mobile' floating islands. However, if anyone looses contact with an island for even a fraction of a second it floats away. The team starts with one less island than members! A fun competition. Up to four teams can compete simultaneously in this hilarious race. The teams mount their skis and attempt to march in unison. 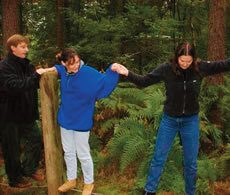 The team is divided into two equal sized groups and members of one group are blindfolded. 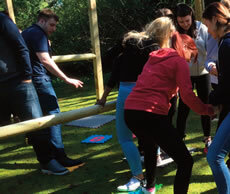 The objective is for the sighted members to guide their blindfolded colleagues through the minefield by using coded instructions. 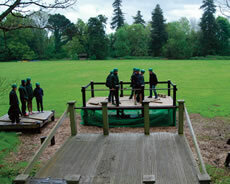 The team must safely cross the whole length of the cable walkway, without anyone touching the ground or using any props. The challenge is to balance ten 6" nails on the head of one 6" nail. Everyone is given a noughts and crosses grid with key facts about one another - you must find people who those facts apply to and get them to sign in the box to complete lines. 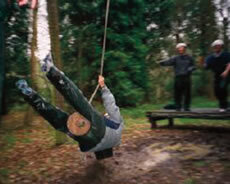 Members of the team are given a role to play, which details their life history. There has been a nuclear disaster and the only place of shelter is the bunker. Unfortunately there are limited places in the bunker - who gets in? The team has to transfer nuclear waste from a disintegrating container to a new safe container, within a contaminated area, without entering the contaminated area. As a group of engineers, the team is tasked with building a continuous bridge across the quicksand, spanning from one 'bank' to the other. An internal separator has failed in a container of plutonium. The material is going critical and must be divided in half before it explodes. The teams must complete an unknown number of tasks within the time provided - they must constantly reinvent themselves to succeed. Two teams have become separated and are on opposite sides of a bottomless ravine. They both have a container, which holds highly fragile, precious material. 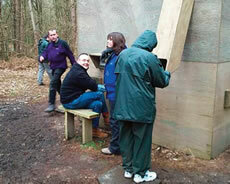 The teams need to unite themselves and their cargo on one side of the ravine, using the equipment provided. Find the correct sequence of connections to launch a solid fuel rocket. A large/multi-team activity. The objective is for the teams 'stranded' on three separate islands in piranha-infested waters, to work together with their varied resources to 'save' the entire group. The Dukes of Holt have fallen out and gone to war! 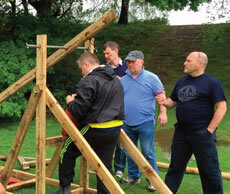 Each team must build a siege engine capable of knocking the opposing team's Dukes head off! At the same time they must build a castle to protect the Duke. In addition they may also act as spies to collect information about the opposing team's activities! The holes in the web represent defects in a new software product, about to be launched. The quality challenge is to eliminate the maximum number of defects in the time allowed having committed to a customer the number of defects they will correct, before starting remedial work. The team has been short listed to build a new steel structure. To win the contract they must build a replica as accurately as possibly. A group is stranded in a cave, with the water rising. 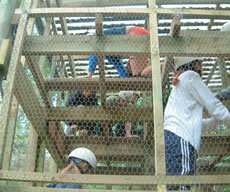 Only a few of the group have a chance of escaping. The team has a profile of the group members and must make the decision as to who survives and who drowns. 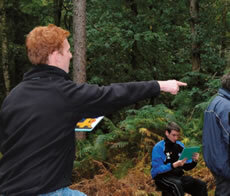 The task is to plan, script and film a commercial for a team development programme. Each member of the team must appear in the film, which must be three minutes long. 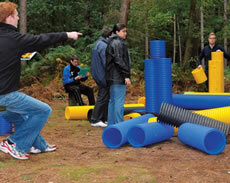 As a team of 'trailblazers' the team must find their way safely through a 3D maze. A multi team Spider's web activity. Four members of the team face the other four on nine blocks. They need to exchange places - but it's not as simple as it sounds! The engine of the team inter-stellar space ship has over heated. To get going again, they must reconfigure the engine but may not enter the engine room. All remedial work must take place outside using gloves and periscopes.